Summer is here! Do you know what is being harvested at your local farm? Would you like to learn how to turn it into five-star food? Join us at the Library as Chef Budd shares how to purchase and prepare the products of local farms. There will be a general lecture, cooking demonstration, and plenty of mouth-watering food and local wine! Tickets are $10 per person and space is limited. Please contact the library to purchase your tickets or for more details. Each ticket purchased will be good for $5 off our Read & Seed Gala in the Fall! 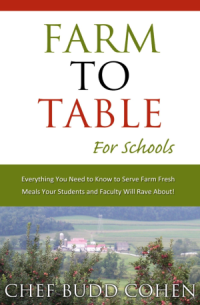 This book provides a step-by-step guide on how to implement a farm-to-table approach for schools, written by a chef who has implemented farm-to-table systems in many scholastic environments. Chef Budd Cohen has documented of one of the most exciting chapters in the Local Foods Movement, helping to ensure a long-term transformation. Farm to Table for Schools adds an inspiring personal story and an instruction manual for taking action.